I truly believe that classroom management can make or break a lesson, day, or even year. 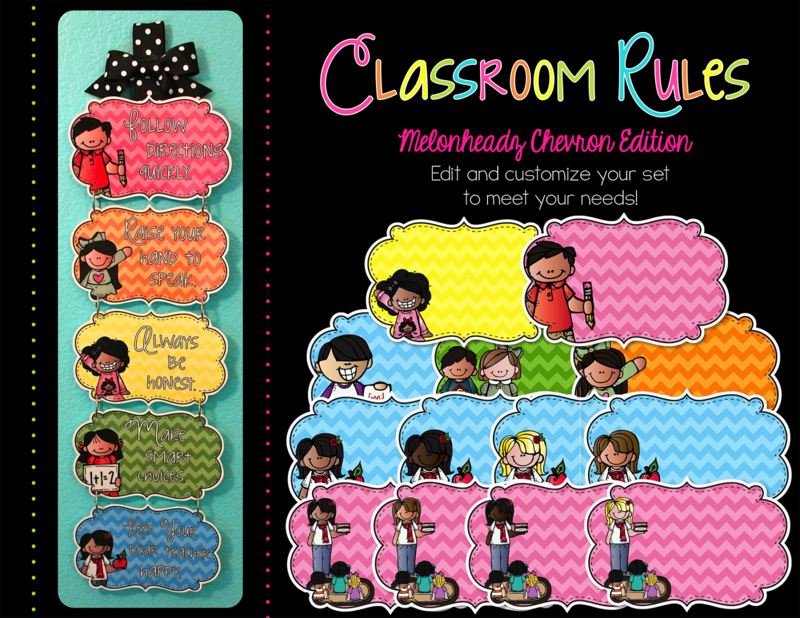 Here is a rundown of classroom management tips and ideas I use in my first grade (2nd grade as of last year) classroom. A couple of years ago I had a rowdy class. Seriously rowdy and filled with all sorts of behavior problems. I learned quickly that my usual stuff wasn't going to cut it. I started looking around for something that would help me. I then ran into Whole Brain Teaching. I implemented Class Yes and the 5 rules immediately and saw a difference right away. A few weeks after implementing the rules, I changed them to better fit the needs of my class. 1. Listen to the speaker. I say speaker instead of teacher, because anyone who is speaking to the class deserves the right to be listened to. Not just the teacher. 2. Raise your hand to leave your seat. This rules is necessary for those students that like to roam around or love to get up at random times to tell you things throughout the day. I make a HUGE deal out of this one. No one likes a liar. My class knows that if they are honest, things will be ok. People are often surprised at how honest my kids are with me. Sometimes kids will do something they shouldn't do in class. I simply ask the class who did the inappropriate thing and the student that did it, admits it, and takes responsibility. I ask them to fix the problem and they do. I didn't think this was any different than any other class until this year when a couple of teachers were observing my class and they looked very surprised at the fact that my kids just admitted they had done something inappropriate. No arguing or denials, just honesty. It's awesome! I think it's due to the fact that we make a big deal out of being honest with each other and we reinforce that every time we review the rules. This rule pretty much covers any possible incident with any other child. Also a very general, but very useful, rule that can be referred to at any time. Another important thing to point out is that we go over the rules any time we enter the room and sporadically throughout the day. 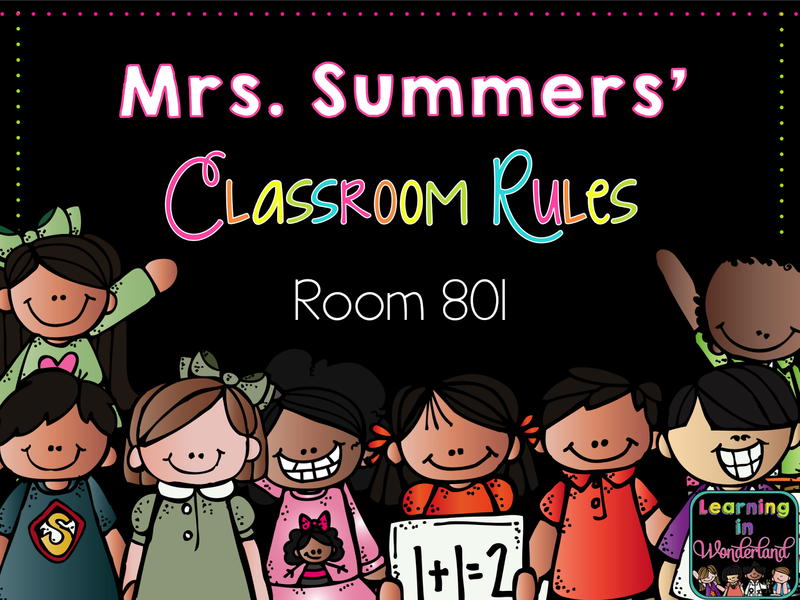 If a child is not following a specific rule, I ask the class what that rule is and we all say it together. Much better than calling out one kid for not following the rules. Keeps it positive and serves as a quick reminder of that rule for the whole class. This summer I created a chart to help us remember our classroom rules. They are available in two designs and I provided slides that coordinate with the traditional WBT rules as well as slides that coordinate with my rules. 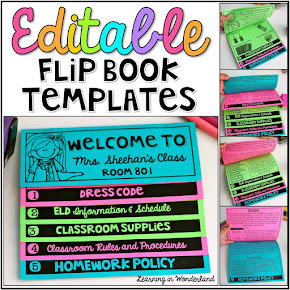 They are editable, so you can change them around and customize the text as much as you would like to make sure they meet your class' needs. One day while I was going over the rules, I was thinking about how nice it would be to have examples somewhere so I could refer to them with my students. 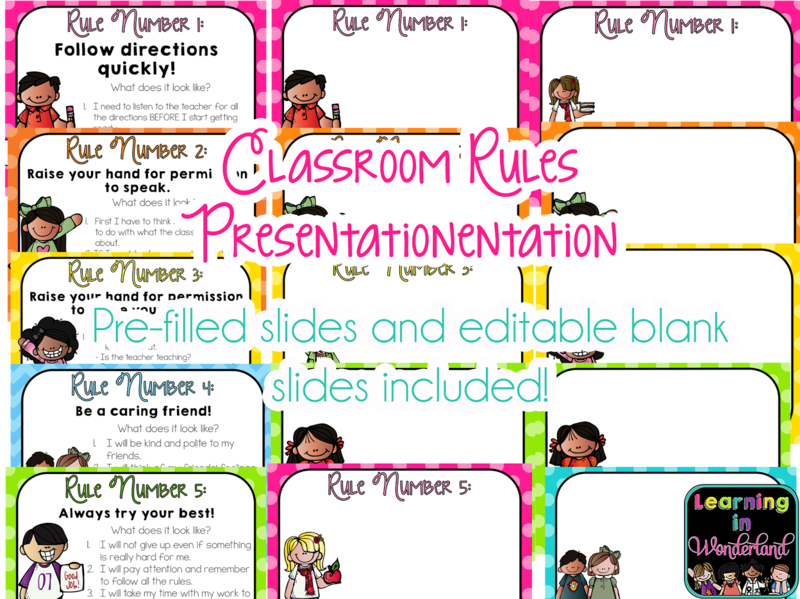 So I created this classroom rules presentation that has my rules on them and more specific information on there that tells us what each rule means or "looks" like. The first slide looks like this and the teacher can just enter their name and room number on it. Sometimes there's no time to turn the laptop on, projector, connect everything...so when I want to go over everything quickly or on the go, I turn to my little cards. All I did to create these was print out my slides two-to-a-page and put them on a ring. So simple, but does the job! Now that they have learned the rules and we have gone over them a million times (this helps to prevent problems so you don't have behavior issues to begin with.) I then bust out our clip chart. I LOVE using a clip chart. I started using one after a saw the success that my teaching partner was having with her class. Some people aren't fans of the clip chart. I say it's all in how it's used. I think if it's used just to point out the bad, it's not going to help anyone. I try to use it as an incentive to following the rules. My goal isn't to bust the bad kids and have them clip down (although sometimes that's needed) my goal is to catch those kids that are doing the right thing and have them clip up. When a student clips down, it's also important to remind them that they can always go back up again. This keeps students from breaking down and giving up on the whole day. The possibility is very real that they can go back to green and very likely go above green. LONG ago I used the green, yellow, red card system and did not like that one bit. The reason being that the kids that behaved just stayed on green the whole day...every day...all year long. The ones that broke the rules were the ones who got to go up to change their card. That seems to defeat the purpose of having a behavior chart. It felt like it was reinforcing negative behavior. Not good. Now how to communicate how each student did each day with parents? Well, I used to send home a parent log and the children colored a circle for the color they got to that day. Unfortunately, these got lost right around Tuesday or Wednesday (even when I gave out prizes for holding on to theirs). I knew I had to make a change. The change I made was to create these small notes that get to go home with each child every day. They are formatted four to a sheet, but can be shrunk down to an even smaller size using your printer settings. Parents love knowing how their child did at school. The red ones rarely go home because if someone got to red, I will most likely call home. But sometimes I can't get a hold of a parent, so I will write a note on the back and ask for a signature. EASY parent communication! My favorite part is handing out the pink and purple ones. The students feel so proud! Again, the goal is to send out positive ones because the children had all day to get back up from yellow, orange, and red, throughout the day. 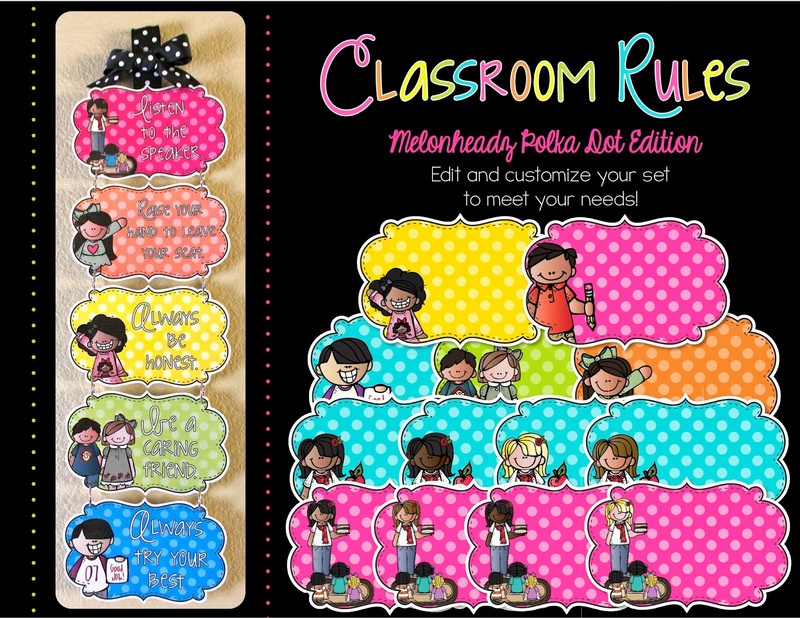 I have some more classroom management tips, but I will save that for another post as this one is already pretty long :) If you are interested in any of the above products, they are available in my store. Just click on the links below the pictures to view them. Thanks for the tips. I love your adapted WBT rules and I like that you introduce the clip chart only after the rules are known and understood by everyone! Thank you Dawn! Yes, I think it's very important to bring out the clip chart once the children truly understand the rules. Otherwise they are clipping up or down and they aren't really sure why they are doing so.